There are some things you’re just not allowed to talk about: your mother-in-law’s weight, your boss’s terrible singing, your partner’s awful navigation skills…and just about everything that goes on in the bathroom. With Brabantia, the unmentionable becomes much more bearable! However your household decides whose turn it is to clean the toilet – whether it’s through arm wrestles, kitchen charts, or loud verbal arguments – Brabantia’s Steel Toilet Brush and Holder will make an unfortunate’s job easier. 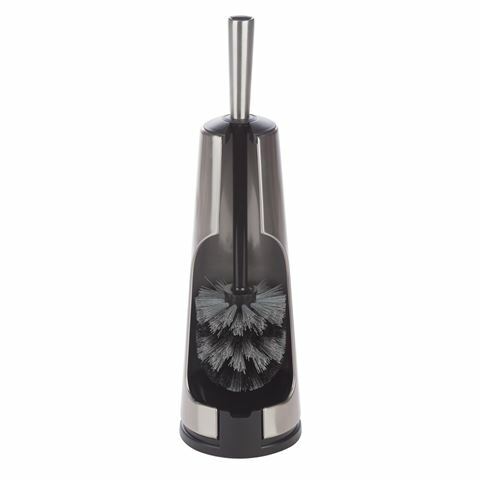 A brushed stainless steel stand hides your brush away discreetly when it’s not in use, while tough nylon bristles on the brush make quick work of the bowl. Who’s up for an arm wrestle? Made from high-quality, corrosion-resistant materials, including stainless steel. Brushed steel finish prevents marks from fingerprints, e.t.c. Tough nylon bristles for cleaning. Discreet storage of brush when not in use. Dimensions: 42cm (h) x 12cm (w), with brush in holder.